Relaxed. From what I saw, that sums up life in Rapa Nui. Almost all of the people on Rapa Nui live in or around Hanga Roa. The town has a couple of major streets, a small shallow-water harbour, two banks, a post office and plenty of stray dogs. The stray dogs enjoy chasing cars and sleeping in front of their favorite restaurant or moai. The island lacks “chain” stores and restaurants because there is a law that allows only people of Rapa Nui descent to own businesses and property. The only notable exceptions I noticed were the airline, the gas station and the phone company. This quality of Rapa Nui sets it apart from any other place that I have visited. One aspect of Rapa Nui that I found very interesting was how they are connected to the rest of the world. The island has few resources and most necessities must be imported. LAN Chile flies into Rapa Nui daily in the high-season and brings perishable foods, the mail, and lots of tourists. Larger cargo comes by way of a once-weekly ship from Chile. Since the island lacks a deepwater port, the entire contents of this ship have to be offloaded to smaller boats for landing. A local told me that this is a one to two day process provided the sea is calm. Fuels (gas, diesel and Jet-A) all arrive by tanker ship which anchors near the Vinapu terminal east of Hanga Roa. They use a big hose to pump the fuels from the ship to shore. As for communciations, the island is way too far off the beaten track to make an undersea cable financially viable. Instead, they rely on satellite communications. Upload and download speeds were impressive (comparable to a cable modem back at home though which much higher delay) and I suspect that the government must subsidize this normally very expensive commodity. Most internet cafes on the island cost about $2/hour though our guesthouse offered free access (after I fixed it, that is!). Another strange aspect of being on the island is that fact that new visitors to our guesthouse could only arrive once a day. I don’t think I have been to any other place where people aren’t free to arrive and depart as they please. Actually, there was one exception to this. On our first day we met a small group of writers and scientists who were waiting on a ship to come and pick them up. They were setting off on a science expedition to study plastic accumulation in the South Pacific Gyre. They had a multi-week sail to Tahiti ahead of them and they were certainly piling on the fresh fruit and veggies at breakfast time. Someday I would love to give that a try. A picture of their boat is below. All in all, Rapa Nui is a quiet and sleepy place and is a perfect place to unwind. It has a great mix of history, culture and, most importantly, the chilled-out island vibe. Tomorrow’s post will be my last on Easter Island. I will share our tips on how to see Rapa Nui on the cheap. On the third day we decided that we had had enough walking and decided to rent a car. In all honesty, we had seen most of the sights that are within walking distance of Hanga Roa. The island’s other treasures are most easily seen by car. After a quick car shopping trip along Hanga Roa’s main drag we scored ourselves a hansome 1976 Suzuki Samurai for a mere 20,000 pesos (approx. $40 US). We actually picked up the car at 6PM on the second day, just in time to head out to some moai for sunset. Ahu Akivi, our walking destination on day 1, was reached in a mere 20 minutes by car. At 7am the next morning we woke up and loaded in the Samurai to catch the sun rising behind Ahu Tongariki, Rapa Nui’s largest restored ahu with 15 moais. The drive from Hanga Roa was quite easy and we were able to find our way in the dark without any problem. After sunrise we drove over to the nearby Rano Raraku which is the quarry where most of the moai were carved. We rolled up at 9AM and found a locked gate. After waiting for 15-20 minutes, one of the park rangers sauntered up in his truck. The park opened at exactly 9AM, island time. Being the first ones to arrive we had the added responsibility of dealing with all the cows that gravitate towards the lush grass at the visitor center. One or two cows is not something that usually bothers me but dealing with an entire herd (complete with calves and their mommies) is a bit unnerving. Amy was doubly-cautious as she selected her neon orange t-shirt for the day. Cows love neon orange, I’m sure. Once we navigated the bovine circus, we could enjoy the spectacle that is Rano Raraku. A lush green mountainside absolutely littered with moai of all sizes. Some upright, some face flat on the ground, others half-buried and many still attached to the rock face from which they were carved. Add some soft amber lighting thanks to the rising sun and it was absolutely incredible. Towards midday we headed over to Anakena beach at the east end of the island. It is the only large sandy beach on Rapa Nui and is absolutely stunning. It is flanked on one side by an ahu with a few moai and at the other side with some coconut palms. We grabbed a picnic table and dug into some tasty pasta salad with island-grown avocado and tomato. Delicious! An hour of lounging on the beach and swimming followed our late lunch and then we started to head towards Hanga Roa. We dropped by Ahu Tongariki (where we watched the sunrise that morning) and snapped a few pictures in the afternoon light. The remaining couple of hours of our rental car time were spent driving up the coast and enjoying the vistas. All in all, a great 24 hours on Rapa Nui! It is hard to make him out but I am standing in front of a huge 60+ ft moai that is partially complete. The edge of the dormant volcano – our destination of the day. The day after our lengthy walk around Rapa Nui we decided to take an “easy day” and visit one of the closest attractions to Hanga Roa: the ceremonial village of Orongo. The village is located on the rim of Rano Kau, the dormant volcano at the far western end of Rapa Nui. The surf was quite rough that morning so we had some good fun watching the waves crash into the rocky coastline on our way over to the volcano. To get to the rim of the volcano’s crater you can either drive a winding road, or you can take a trail that takes a steeper and more direct route. At sea level the trail weaves its way through some small farms that enjoy the wind protection afforded by the mountain before breaking out into a clearing covered mostly by guava bushes (they are all over the island). Slightly further on is a small band of eucalyptus trees and, from there, it is grass all the way to the top. Once we reached the rim of the crater we had a spectacular view of the freshwater marsh inside of the volcano. Though we couldn’t see it up close, the vegetation inside of the crater was noticeably different. Some signs along the way indicated that the cone of the volcano creates a completely different ecosystem by sheltering its contents from wind and by trapping rainwater. At the far west end of the crater rim is the ceremonial village of Orongo. The village, which was the center of the birdman cult, was inhabited until the mid 19th century. The stone buildings as they stand today were restored in the mid 1970′s but much of the stone is original. The roofs of the houses are stone but they are covered in a thick layer of grass. It is not known whether these houses we occupied permanently or only during ceremonial times. Speaking of ceremonies, one of the birdman cult’s more interesting annual competitions was to retrieve the first sooty tern egg laid on the nearby islet of Motu Nui. The competitors had to depart the village, survive the 250m descent to the ocean, swim a few kilometers, fight off some seriously angry birds and then go all the way back to the village while carrying an egg. I’m am sure that the village’s stunning location perched the cliff above the ocean made this competition quite fun to watch! In addition to the stone houses and spectacular views of the volcano and the ocean, one can also find numerous stone petroglyphs at Orongo. Some of them are pretty hard to discern (and to photograph!) but they are very interesting nonetheless. The descent to Hanga Roa was much faster than the climb. Part of this was due to the downhill slope and the other part was due to the fact that we had a rainstorm bearing down on us. All in all, this little excursion ate up about half a day and was certainly worthwhile. Given more time I think it would be fun to hike all the way around the rim of the crater, I read somewhere that this is doable in a day. Maybe next time! Amy’s favorite part of the day: a nice seasaw complete with turtle seats. We rode it. Half way up the volcano we happened upon a rest station. Much-needed as we are wimps. The restored ceremonial village of Orongo which is on the rim of the volcano. My apologies for the delay in posting. Getting access to the Internet while on Rapa Nui was a bit harder than expected…at least until I repaired our guesthouse’s connection towards the end of our stay. Our flight from the mainland with LAN Chile was uneventful and we had a great view of the Juan Fernandez archipelago along the way. Arrival at Rapa Nui’s Mataveri International Airport is a fun experience in and of itself. Of course the airport doesn’t have a large terminal building with jetways and the like. All passengers take the stairs and stroll across the tarmac into the open air terminal where a local band is playing and girls are handing out flowers. Before we knew it we were packed into a late 90′s Nissan being whisked away to our guesthouse in Hanga Roa, the island’s only village. I will post more about our accomodations, the village and our budget in later posts. But first, some moai! Before we flew to Rapa Nui we had read that while many tourists rent cars for their entire stay, it is possible to see many of the sights on foot. On our first full day we decided to walk part of the northwestern coast check out the moais, lava tubes, and rolling green countryside. The tourist office told us that the loop would take 4-5 hours and to bring lots of water as there is no safe drinking water outside of Hanga Roa. Much of the island’s coastline is like this. Just outside of Hanga Roa is Tahai which is a restored ceremonial site where one can find three ahu (stone platforms) with six moais (stone heads). Further up the coast, there are some nice lava tubes at Ana Kakenga which you can explore if you have a flashlight. Two of them are frequently visited by tourists and lead out to the sea where there is a nice view of the ocean. Heading into the caves was a nice repreive from sun. After Ana Kakenga the road turns inland and climbs gradually to Ahu Akivi. Ahu Akivi is a complex of seven moais that are unique in that they face the ocean. All of the other ahu on Easter Island are located along the coast and their moais face inland. Ahu Akivi was gorgeous and arriving on foot meant allowed us to wait until a tour group departed. After that, we had the place to ourselves. The walk back to Hanga Roa from Ahu Akivi was arduous. When it was all said and done, our four-to-five hour walk had turned into a seven hour adventure. Nevertheless, it was well worth it and best of all it was completely free. One of the biggest attractions in southern Chile is Torres del Paine National Park. Most visitors to the park complete multi-day treks such as “the W” and “the circuit” but, being short on time and perhaps toughness, we opted for a simple day tour ($40 per person) of the park’s highlights. After a hearty breakfast at the Yaganhouse hostel in Puerto Natales a bus picked us up at the dark hour of 7:30am. We were the first ones to board and, consequently, were able to snag the two front seats. The huge mouth of the cavern. Amy pictured at center. On the drive north to the park, we made a very short stop at Milodón Cave. The milodón is an extinct giant ground sloth and apparently the remains of quite a few of them were found in this cave. We believe it is Puerto Natales’ claim to fame as its silhouette is depicted on all the town’s street signs. Oh, and there is also a giant metal statue along the road into town. The cave was nice enough (it is impressively large) but perhaps not worth the 6 USD entry fee since we were only there for 30 minutes. Laguna Amarga (Bitter Lagoon) has extremely high mineral and salt content. Before we reached the park we started to see large herds of guanaco, a few ñandu and we managed to catch our first glimpses of the spectacular mountains. Before reaching the guardhouse we stopped at Laguna Amarga (Bitter Lagoon) a stunning turquoise-colored lake tinted by the heavy mineral content. Unlike most of the other lakes in the park, this one is “closed” meaning it has no outflows of water. The continuous evaporation makes the water six times saltier than sea water and the banks are crusted with white salt. We paid our entrance fee (30 USD for non-residents) and drove onward to Lago Nordenskjold. Before unloading at the mirador, our guide warned us numerous times about the strong winds. Sure enough, we jumped off the bus and before I knew it Amy was chasing her glasses which had been ripped from her face. The winds that day were in excess of 100kph and we heard later that some climbers had been blown off one of the peaks. A couple of stops later we checked out the very scenic location for Hosteria Pehoé in the middle of Lago Pehoé. We took a lunch break at a small tourist village outside the park. Some of the people on the tour had their meals included, however, we budget-sensitive travelers had packed our own food. They still let us eat in the restaurant and enjoy the spectacular views. Our final scheduled stop was at Lago Grey on the western end of the park. Lago Grey has a wide stony beach and, on a clear day, a view of the Gray Glacier some 10+ km away. Unfortunately, the high winds that day were kicking up so much mist from the water that we could scarcely make out the glacier. We were able to spot some electric blue icebergs. One upside to the mist was that it produced a very nice rainbow over the beach. A rainbow over Lago Grey. Made possible by the mist being kicked up by the ferocious winds. On the way home, as a final treat, we managed to spot an Andean Condor. These birds have the largest wingspan of any land bird at 10.5 ft. They aren’t all that rare, however, it is pretty uncommon to see one up close and I was very happy that we had those front bus seats so that I could hop out and snap a photo. We had the best seats on the bus. The torres (towers) from afar. Amy enjoying the wind-free comfort of the inside of our bus. Chile is a big country. It is certainly possible to travel by bus but distances are absolutely vast. 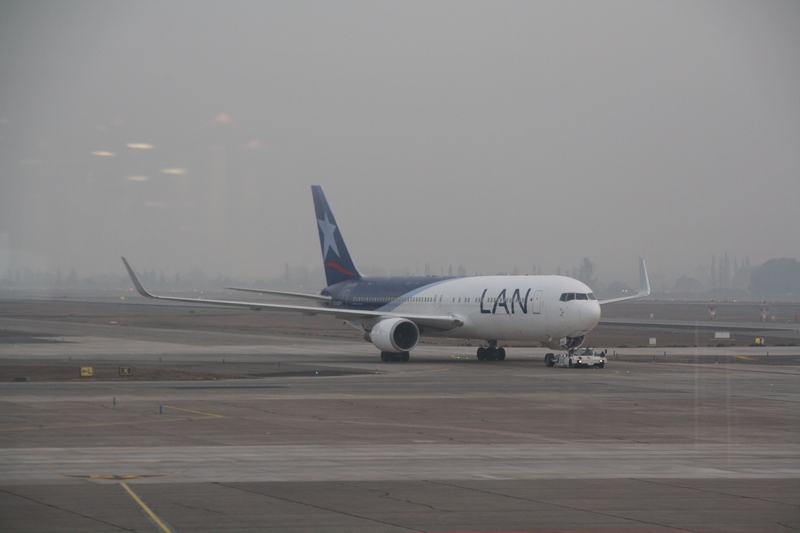 Before I left on my RTW trip I researched mileage redemption options within Chile in hopes of finding a cheaper and more comfortable way around. As it turns out, British Airways has a very generous mileage award for travel within Chile. Easter Island has long been on my list of places to see and, being part of Chile, is accessible using this British Airways award on their partner, LAN Chile. At the suggestion of some friends I decided to see just how far I could stretch one of these tickets. Surprisingly, the agents at BA allowed me to piece together a very elongated routing (over 7,500 miles!) that would not only allow me to visit Easter Island but also the far south of Chile. 20,000 miles and $59 in taxes later it was ticketed. The first flight on this ticket was from Puerto Montt to Punta Arenas in Region XII of Chile. It is a relatively short two-hour flight and, provided it is clear, you are treated to spectacular views of fjords, mountains and glaciers. Upon arrival in Punta Arenas we immediately made our way to the bus terminal to catch a bus north to Puerto Natales which is the jumping off point for Torres del Paine National Park. On our second day on Chiloé we woke up to a thick fog and piled on a heavy breakfast at the hostel. The rain had stopped and it looked like the sun was trying burn through the fog. We jumped in our trusty Chevy and headed east to find the coastal road that stretches from the port of Chacao (where our ferry from Puerto Montt landed) to Castro which is about half way down the island. The dirt road took us through a hilly green countryside that was covered in small farms. We passed through numerous seaside villages and stopped to see some of the wooden churches and seaweed-covered beaches. It appeared that many of the homes were involved in the seaweed industry as they had piles of the stuff drying nearby. We made it to Quemchi, about halfway to Castro, by the early afternoon and realized that our progress down the coast was much slower than expected. We made a quick visit to the mirador in Quemchi to get a bird’s eye view of the village and the fish (shellfish?) farming rigs out in the bay and then hopped on Ruta 5 for Castro. Castro, the pricipal city on Chiloé (population 40,000), was quite lively when we arrived. We pulled into a parking spot right along the main square and only had to walk a few steps to the tourist office. We have been very impressed with the tourist offices both here in Chiloé and in the Lakes District of Argentina; they know how important tourism is and the materials they provide are very good. The first item on the to-do list in Castro was lunch. We had heard that there were some nice waterfront restaurants down by the market so we headed in that direction. Within minutes we were sitting at a nice table right by the water-facing window of a stilthouse. After spying on the food on the surrounding tables I decided to give curanto a go. Curanto: a big bowl of mussels, clams, chorizo, chicken, pork and some sort of bread patty. Served with broth. Curanto is a hodgepodge of shellfish, meat and potatoes. Traditionally, it is cooked in a hole in the ground but I suspect that what I had for lunch was prepared in a stew pot. The enormous bowl included a very generous serving of mussels, clams, chorizo, pork, chicken and milcaos. The mussels were absolutely massive, definitely the biggest I’ve seen and were exceptionally tender. Certainly not the chewy sand-filled things I often get around Boston. In the end, I wasn’t able to finish the entire bowl but I guess that isn’t too surprising seeing that the three ladies sitting next to us split one bowl between the three of them. The meal was an exceptional value at 8 USD. After lunch we visited the massive chuch of San Francisco which is the largest of the wooden churches on Chiloé. Next, we headed to another section of waterfront to check out the colorful palofitos which are traditional stilt-house. Before we knew it our time with our rental car was up and we had to return it to Ancud. I was happy that I didn’t have to wash it! It is 8:30am local time and we are sitting at gate 25 at Santiago’s airport. At 9:30 we are scheduled to depart to Rapa Nui, one of the world’s most remote islands. We will be flying in a shiny LAN 767 complete with winglets modifications and have secured some nice exit row seats. Amy has informed me that the distance from Santiago to Rapa Nui is equivalent to the distance between Punta Arenas and Arica which are Chile’s southernmost and northernmost cities – 3760 km or 2336 miles. We departed Punta Arenas yesterday morning just after their first snow of the year and we are definitely looking forward to the warmer weather on Easter Island. Stay tuned this week for posts and photos of our time down south which included a spectacular day at Torres del Paine National Park. Ancud and Chiloé Island are absolutely verdant so it is no surprise that they get about 300 rainy days each year. Our first full day in Ancud was just that. Somewhere between a drizzle and a mist. The good news is that it was light enough to be tolerable for some sightseeing around town. One of the priciple attractions on Chiloé are the UNESCO listed wooden churches that dot the island. There is a nice little museum in Ancud that discusses the very clever carpentry techniques that were devised to build these impressive structures. Another draw of the island is the scenic coastline that is dotted with colorful houses. Since we only had two full days on Chiloé, we once again opted to rent a car to see some of the surrounding countryside. Seeing the island using public transportation is certainly doable but it takes a bit more time. We picked up another Chevy Corsa (the budget car of choice in S. America I am learning) from a local rental argency for about 50USD for 24-hours which included a generous 450km. Our little hatchback included my newly-appreciated feature: power steering! Despite the setting sun, we decided to make a dash for the Faro Corona (lighthouse) at the end of the Lacuy Peninsula west of town. We made it there about 30 minutes after sunset and found ourselves in front of a closed gate at a dead end in the road. A guy in a naval uniform came out and told us that the visitor center had closed a few hours earlier and that we should come back the next day. Bummer, we thought. Just as we were about the jump in the car for the hour drive back to town, his commander leaned out the window of one of the buildings and shouted something along the lines of “oh, just let them in!” A short while later one of the officers was giving us a private tour of the facility. It was foggy and drizzly but that made the lighthouse even more spectacular. We learned that the lighthouses are staffed by naval officers who are on a four month rotation. The man showed us photos of some extremely remote lighthouses where he had been stationed in the past. One of them was perched on a jagged rocky island somewhere in the middle of nowhere, only accessible by boat then helicopter. What a crazy place to live! In addition to maintaining the lighthouse and fog horns, the officers are also responsible for tracking ships once they depart for the open ocean. If they don’t come back on schedule then help will be sent. Amy enjoying the view from the sunroom at the hostel. Man gathering seaweed. He said it was for use on your hair or scalp. 4-lane highways. Welcome to Chile! The day after our trip to El Bolsón it was time for us to cross the Andes to a new country for the both of us – Chile! One of the classic ways to cross is the famous “cruce de lagos” which is a full day of switching between buses and boats as you trace your way across the mountain range. Unfortunately, this trip is quite expensive and from what we read the quality of the experience is highly weather dependent. To save some precious pesos we bought a Bariloche to Puerto Montt bus ticket for about 30USD each from the ever-present Via Bariloche. A foggy morning at the top of Cardenal Antonio Samoré Pass. I had visions in my mind of a harrowing 14,000ft mountain pass on a gravel road but in reality the Cardenal Antonio Samoré Pass is pretty tame: below 1300 meters and beautiful tarmac the whole way. About an hour of the journey is spent on border formalities and most of that was on the Chilean side. Chile is very protective of their agriculture and import bans on fruits, vegetables and animal products are strictly-enforced. At the border they completely unloaded the bus and ran all the bags through the xray. Meanwhile they have a working dog sniffing the ins and outs of the bus. It was impressively thorough, I have to say. Our bus on our boat. Within thirty minutes of our arrival in Puerto Montt we were already on another bus headed south to Ancud on Chiloé Island. The total journey (8 USD) takes about three hours and maybe 30 minutes of this are spent on a drive-on, drive-off ferry. Cruz del Sur, the bus company, also operates the ferries so the timing is nicely orcestrated and wait times are minimal. The water crossing was smooth and we even managed to spot a few penguins. We pulled into Ancud around 5PM and made our way to an excellent hostel (Hostal Mundo Nuevo) on the waterfront that was to be our home for the next three nights. Amy crashed out on the bus to Puerto Montt.